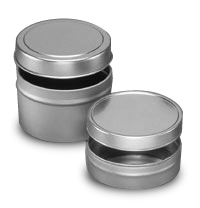 Deep style tins have rolled edges and are suitable for a variety of purposes such as ointments, candles, or lab use. Item #22-3 is a straight edged tin and does not have a rolled edge. All cans are seamless tin plated steel.